Irish Genre-Painter and Artist. Biography, Paintings. 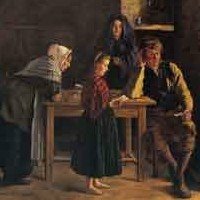 A painter and recorder of Irish provincial life, James Brenan was one of the most influential figures in the history of Irish art of the 19th century. He is not to be confused with James Butler Brenan RHA, the Cork portrait painter. Born in Dublin, James Brenan studied at the School of Art in Leinster House, the Royal Hibernian Academy School and the Royal Dublin Society school of drawing, before leaving for London where he studied painting under Owen Jones and Sir Matthew Digby Wyatt. After this, in 1857, he trained as an art teacher and taught at the Birmingham School of Art. He also took part-time teaching jobs in Liverpool, Taunton and Yarmouth. In 1860, he was appointed Head Master of the Crawford School of Art in Cork - a position he held until 1889. While in Cork, James Brenan played a key part in inducing William Horatio Crawford (1812-1888) to sponsor the magnificent upgrade of the school's premises (now the Crawford Gallery), and in arranging the important Gibson Bequest for the collection of the Crawford Art Gallery. (See also History of the Crawford). In 1889 he was appointed Head Master of the Metropolitan School of Art (now the National College of Art & Design) in Dublin. Among his pupils were future master-painters Henry Jones Thaddeus and William Orpen. A very popular and active head teacher, Brenan remained at the school until his retirement in 1904. He died three years later. James Brenan exhibited numerous paintings at the RHA between 1861 and 1906. 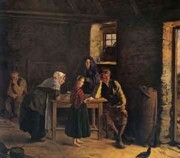 His paintings were often realistic genre-paintings of Irish social and provincial life, including many small pictures of cottage interiors and scenes of Irish rural life such as "The Village Scribe" and "Left Behind". His painting "Letter from America", which portrays a young girl reading a letter received from America to her illiterate parents, highlights the spread of universal education in Ireland in the mid-nineteenth century. Brenan was also an accomplished landscape artist, exhibiting several works at the Royal Scottish Academy in the years 1881-1885. He never exhibited at the Royal Academy in London, although he did show at the Walker Art Gallery in Liverpool. Three of James Brenan's oil paintings appear in the collection of the Crawford Municipal Art Gallery in Cork: Letter From America (1875), A Committee of Inspection (1877) and Patchwork (1891).  For more about traditional painters like James Brenan, see: Irish Art Guide.